1 drawing on paper mounted on paper ; image 7.125 x 7 in., on sheet 8.625 x 8.5, paper support 14 x 8.5. 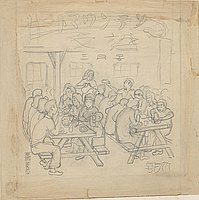 Pencil sketch of people seated at two tables for a meal at a mess hall. 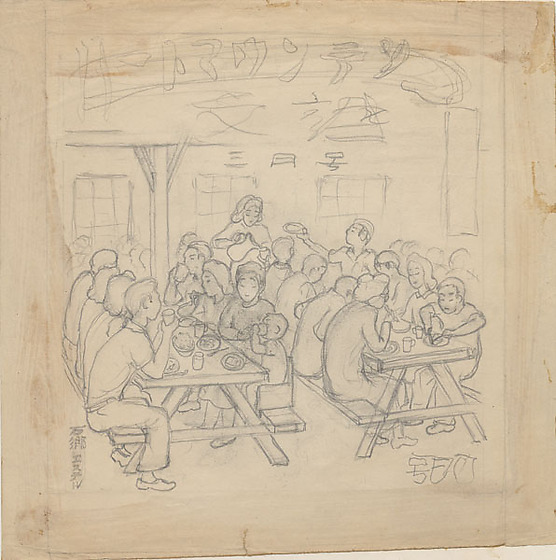 Clearly defined people in foreground sit on wooden picnic benches as one woman, back center, stands and fills a cup with a pitcher; man seated near her holds up his plate to her. A woman helps a child in a booster chair drink from a cup. Figures, back left, are without detail. One pillar in center ; three windows in background. Japanese characters (katakana and kanji) written at top above image, translated: Heart Mountain literature, March issue. Appears to be a precursor to drawing 94.195.12.